The destroyed golden minarets are seen at the shrine of the Askariya mosque on Wednesday. 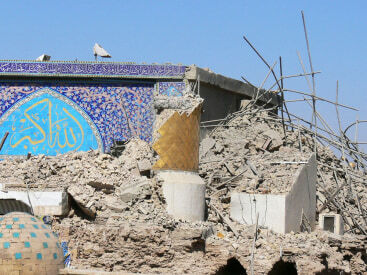 June 13: Iraq braces for more violence after another bombing at the Golden Dome shrine in Samarra. NBC's Jim Maceda reports. If you’re a Sunni jihadist in Iraq, such as a member of al-Qaida in Iraq (AQI) organization of the late Abu Musab al-Zarqawi, things are not going well for you of late. The Iraqi Sunnis, once your ally in the fight against the Americans, have turned on you. Many of the Iraqi groups that once were your allies are now hunting you down. Your major success over the last 15 months, one of your stated goals, was plunging the Arab portions of the country into a sectarian civil war – Sunni against Shia. Since the American and Iraqi forces’ “surge” operations began earlier this year, the Shia have mostly stayed out of the fight, allowing the coalition forces to concentrate on you. The Shia leadership, be it Addul Aziz al-Hakim, Ayatollah al-Sistani or even Muqtada al-Sadr, inspires great moral discipline among the Shia. To reignite the civil war, it is necessary to goad the Shia to reengage the battle. Up until now, you have been unsuccessful. Ah, so you take a look at what has worked in the past. You have to hit the Shia hard enough to make them react. Pick a target that will generate retaliation no matter what the calls for calm from the Shia leadership. Your memory turns to the Golden Mosque in Samarra. In February 2006, AQI thugs attacked the mosque and severely damaged the 100-year old gold-plated dome. The twin minarets were left standing. Samarra is an excellent choice of target for the Sunni jihadists. It sits in the middle of the “Sunni triangle” about 75 miles north of Baghdad, making it easy for you to attack. The Golden Mosque is revered among the Shia as probably the fourth holiest site for the sect. The shrine is also known as the Imam ‘Ali al-Hadi and Imam Hasan Al-‘Askari mosque, named for the 10th and 11th imams of Shi’a Islam and two of the “14 Infallibles.” The two ninth-century imams, father and son, are buried in the mosque. Samarra is also the birthplace of the twelfth imam, Imam Muhammad Al-Mahdi (and son of 11th Imam Hasan Al-‘Askari). His shrine - not his tomb - is adjacent to the Golden Mosque. It is not his tomb, because in “Twelver” Shi’a, so named for the 12th imam, it is believed that he is still alive but in hiding (“occultation”) and will return prior to the Day of Judgment to establish justice on earth. Twelver Shi’a are dominant in Iraq, Iran, and Lebanon. It is the main sect of Shia Islam. Although the initial reaction has been somewhat muted, the jihadists just may get the reaction they seek. This strikes right at the heart of the Shia faith. To Christians, this is akin to blowing up the Church of the Holy Sepulcher.